This newest post in the series on how to use your tax return to start a business at home is about… blogging! Of course, this one is near and dear to my heart since I’ve been blogging for about 14 years and love it. If you’ve ever wondered how to make money at home blogging, read on. The women I interview below are fellow members of a private membership forum of students who have taken a class called Making Sense of Affiliate Marketing. I’ve gotten to know them over the last few months and share their stories below. Their answers to the same four questions are below, with my own thoughts in italics. Don’t forget, if you are interesting in making money from a blog, be sure to visit this page to download my free report, 100 Best Blogging Tips. I first spoke with Kecia Hambrick of From Mom’s Desk. It provides practical solutions for busy work at home moms that need help finding balance in their lives. Kecia is a mom of two and is practically my neighbor – she also lives in northwest Georgia, USA. How much money does it take to start a blog? You can start a blog for less than $50 for the first year. This includes purchasing a domain name and signing up for web hosting. There are options to start a blog for free, but I recommend investing a little money to get a professional set up from the beginning. You may also want to invest in a professional theme or design as soon as you can, but it’s not a requirement to get started. Who is blogging right for? Does it take a certain personality to make money with a blog? The beauty of blogging is that just about anyone can financially benefit from it! With such a small investment, blogging can be perfect for anyone wanting to earn an income online. Right off the bat, I would say that blogging is great for stay at home moms that want to earn supplemental income for their household. 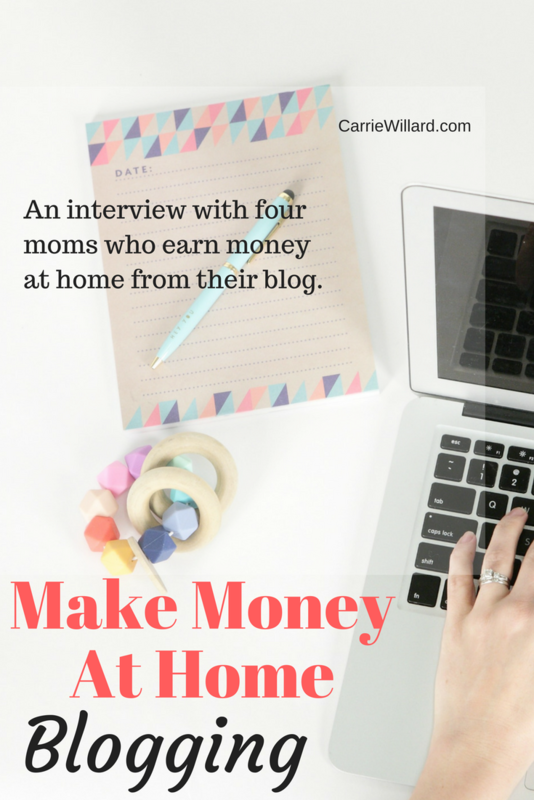 Working moms can also blog for extra income. Understand that blogging is a time investment, so you would need at least 5 hours per week to create content and promote your posts to be successful. What is the income potential with blogging? The sky is truly the limit! I know bloggers who make just a couple hundred dollars through blogging, as well as those that make 5 figures per month. It’s all about how much time and effort you put into growing your blog. Please understand that blogging is a “long game,” meaning you may have to work at it for several months before you start to see a good profit for your time and investments. You need to create quality content to meet your readers’ needs, great photography (whether your own or stock photos), and to consider growing your income with your own products, courses, or ebooks. Most bloggers earn with advertising, sponsored posts, and *affiliate marketing when they first start out. First and foremost, I would have to say I love the freedom that blogging has given me to stay home with my children. I don’t miss a field trip, party, or parent-teacher conference at my kids’ schools. Also, I love that I get to share my opinion with the world through opportunities with my favorite brands! With affiliate marketing, my favorite thing is the passive income. Once you create a post and put your affiliate links inside, you can continue to earn from that single post for years to come. Kecia offers a free blog monetization checklist here – very helpful to new bloggers who want to learn how to make money at home blogging! 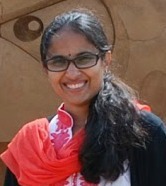 Next, meet Sireesha Narumanchi – a mom of two who resides in Melbourne, Australia. In 2008, when Sireesha began looking online for legitimate work-from-home job opportunities, she quickly realized she had her work cut out for her. 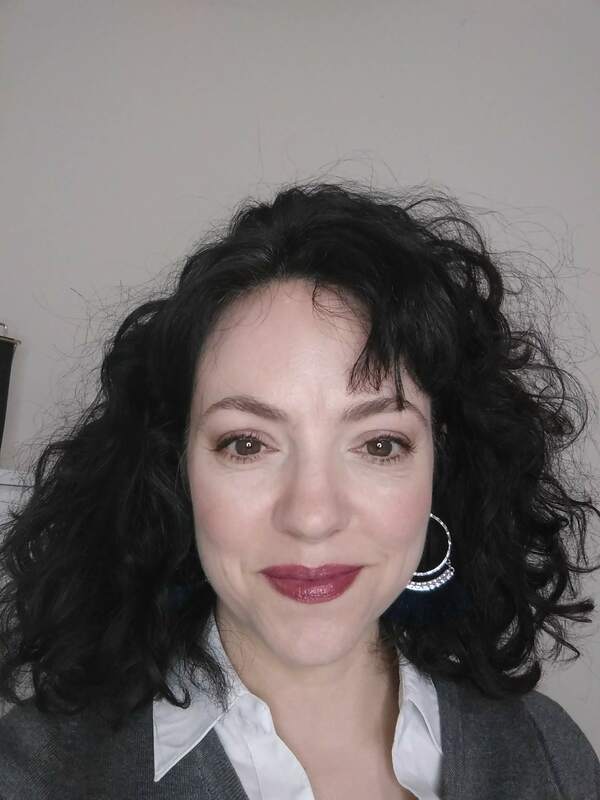 After landing a great position, she started a blog, CrowdWorkNews, to offer work-at-home job leads. She gives tips and advice to help other people looking for legitimate job opportunities avoid pitfalls. Starting a blog does not cost much. I started mine with Bluehost for only $3.95 per month. Apart from the hosting, you will need a theme (if not opting for a free one), an email marketing service like *Aweber or Convertkit. All other things like auto schedulers are optional. Who can make money at home blogging? Blogging is perfect for anybody who wants a flexible income stream. Whether you are a stay at home mum or someone who needs a side hustle, this can be the right choice. What is the income potential? This the best part!! The income potential is really infinite. It totally depends on your hard work and the strategies you implement. I started my blog 7 months ago and now I am making around $4000 a month from my blog. Blogging has given me the freedom to do things that I love and still make money passively. I believe the flexibility is the biggest factor for blogging. I love affiliate marketing. Most of my income every month comes from affiliate marketing. Of all the ways of making money from blogging, I prefer affiliate marketing as it is totally passive. 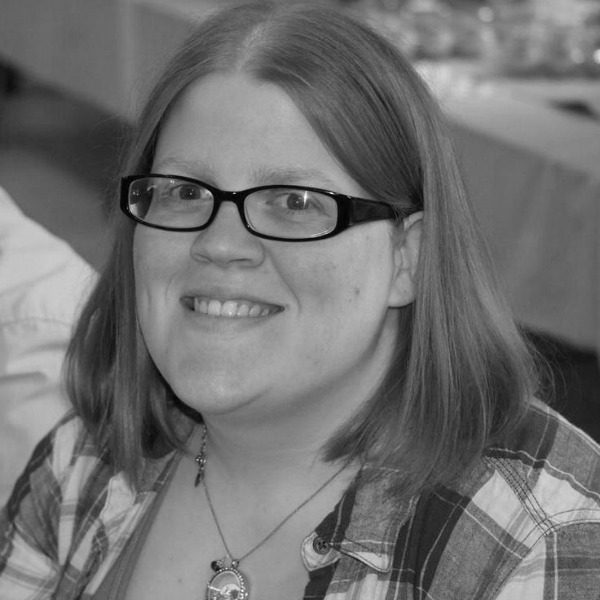 My next interview is with Emma Healey of MoneyCanBuyMeHappiness. Emma is a mom and world traveler. 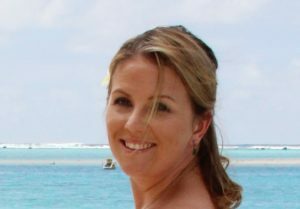 Her blog helps people optimize their income (no matter how small) to achieve their dream life, whether that be long-term travel, early retirement or becoming a stay-at-home mom. It cost me well under $100 for a years’ worth of hosting which included my domain name and a basic theme. After I started earning money from my blog, I paid around $500 for a professional design, but you can certainly start with a basic theme. Who is blogging right for? I’m not gonna lie, it doesn’t suit everyone. You have to love writing, be passionate about helping others and have patience. Because making money from blogging takes time. I know others get there faster, but it took me three years of casual blogging to start making money. Now, I make between $500-$1000 per month from my blog, and I’m so glad I didn’t quit a year ago. (I love Emma’s answer! I agree that blogging is not for everyone. When bloggers say this, I think what they actually mean is that anyone with a passion for a topic who loves writing can earn money from a blog, no matter what the niche. Blogging takes patience and hard work on the front end. It requires creating good-looking graphics and a bit of technical skill. Also, a recent survey of bloggers found that most were more on the introverted spectrum. People who need to be around people all day might do better with a different type of business. For example, direct sales. People who love to make things with their hands and are crafty may prefer an Etsy business. Etc. What’s the income potential with blogging? Unlimited! Really, once you dig into all the different ways to make money blogging, you realize the massive opportunities. That said, it’s fine to create a part-time income also. I have 2 little boys and a business to run so my blogging time is limited. I’m also traveling around the world with my family at the moment. I’m writing this from a hotel in Mexico. I love that I am still making an income for my family, even while we travel! The community! All the amazing people I get to meet virtually through Facebook groups. Everyone is so supportive and welcoming. I also love that I get to work from home or anywhere, whenever suits me and make extra money for my family. Emma wrote a great post about how it’s possible to make money even with a small blog here. Wow this was fun! Thanks so much to the ladies above who participated. 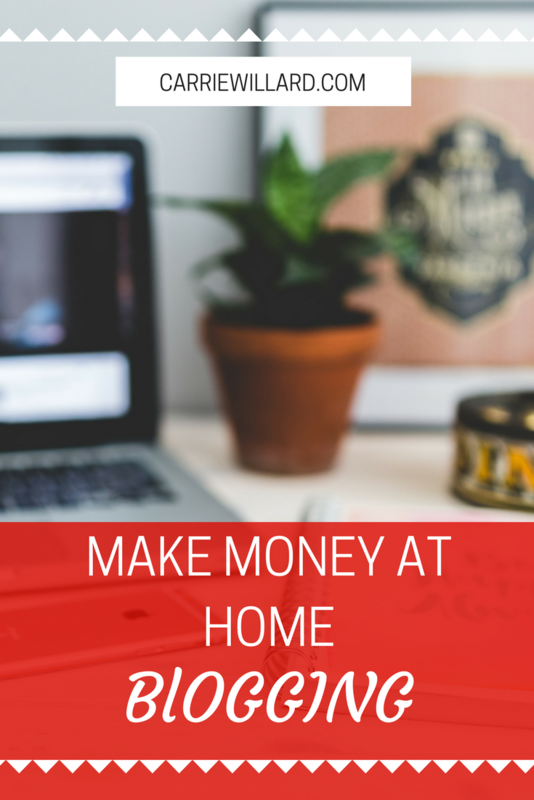 For more information about how to make money at home blogging, see my free report with 100 of my top blogging tips here. All of the women I interviewed here, as well as myself, are graduates of a course called Making Sense of Affiliate Marketing. Highly recommended, both for beginning bloggers and more seasoned ones. Also, see my list of recommended blogging resources here for the tools I use daily in my blogging business. Do you have any questions for me or the ladies above about making money blogging? Please leave them in comments! Thanks so much for including me, Carrie. Some great tips here! Nice interviews! It’s absolutely incredible how much extra money people can make from their blogs. Even small ones with just a few posts and modest audience can still add 3 to 5 figures of income to their bottom line every month. It’s an opportunity that’s too good to pass up! Thanks for participating! It was great getting to know you better. Congratulations on your new car! I’m off Instagram so I’m a little out of the loop and didn’t know about this. All that being said, I think I just accepted that I would really like to start a blog. I’m not sure what about, but I’d like to get together and talk about it one day.